Goal to Work Ballina Sports Coaches at presentation day last May. The Goal to Work program has been one of the success of the Mayo Sports Partnership. 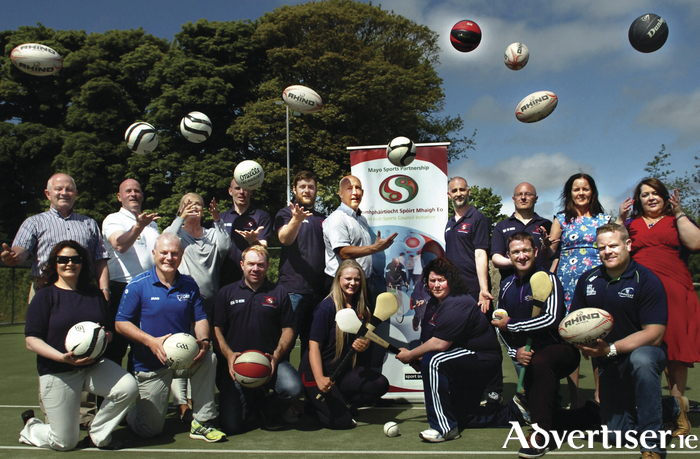 Development of community sports hubs, jobseeker sports coach training and youth sport leadership programmes, all courtesy of Dormant Account funding, were key outcomes from the 2015 annual report of the Mayo Sports Partnership. Launching the 2015 report outgoing Sports Partnership Chairman Cllr Brendan Mulroy complimented volunteers involved in clubs and communities who contribute towards providing a high quality of life through sport and physical activity. The report, describing the workings of the Sports Partnership during 2015, highlighted the development of sports hubs in places such as Westport Leisure Park, Lough Lannagh Castlebar, Belleek Ballina and more recently through Dormant Account funding The Maples Recreational Park Ballyhaunis. A Sports Hub seeks to provide a home where people of all ages and abilities can participate in a range of programmes or initiatives; it could be a leisure centre, recreational park, school or outdoor area. Future development of Sports Hubs will be a priority for the Partnership in strategic sports planning and will depend largely on collaboration between all stakeholders to ensure success. Other highlights from the report demonstrates that Mayo Sports Partnership and its stakeholders provided physical activity opportunities for some 11, 652 people through 69 locally delivered participation programmes, 3263 female participants in 8 local Women in Sport programmes and 403 people with a disability in 18 Sports Inclusion Disability Programmes. Approximately 570 volunteers were involved in the delivery of these initiatives with the annual flagship programme the West of Ireland Womens Mini Marathon involving some 2,000 people overall. In addition the sports umbrella body ran 19 training and education workshops with 711participants, supplied information to 580 clubs / organisations and over 12,000 people contacted the Partnership for general and sports specific knowledge. 2015 saw the Partnership celebrate its 10th Anniversary since its launch on the 10th March 2005 in the Westport Leisure Park. Since then it has delivered 516 programmes targeting 62,374 people from all sectors of the population in Mayo plus 54 Women in Sport initiatives for 31,263 Women. Cllr Brendan Mulroy Chairman of Mayo Sports Partnership thanked former Minister of State for Sport and Tourism Michael Ring, key stakeholders John Treacy and staff in Sport Ireland, CEO Mayo County Council Peter Hynes, Director of Services Joanne Grehan along with the many other partners who contribute to the continued development of the umbrella sports body. “ Much credit must go to Sports Partnership Director Charlie Lambert and staff for continually delivering high quality participation programmes and working with local agencies and all sections of society.” Cllr Mulroy added.